EAST LANSING, Mich. – Nothing is easy. Every possession is a battle. Every trip down the floor meets several levels of resistance. That's the reality of facing No. 6 Michigan State on its home court, as Purdue learned Tuesday. The Boilermakers hung in and battled all night, but shot just 31 percent from the field while Cassius Winston poured in 23 points for the Spartans and Purdue fell short of a road upset at the Breslin Center, losing 77-59 in front of an announced crowd of 14,797. Coach Matt Painter could have spun it as a moral victory for his young team, going toe-to-toe with one of the best teams in the country. He went with a different message: no moral victories. "You say, 'Ah, they're gonna come in here and give you a good fight,' well we want to come in here and win," Painter said. "I'm glad every one of those guys are in our locker room, but tonight wasn't good enough. (The Spartans) were physically and mentally tougher than we were." The win was the ninth straight for the Spartans and they improved to 9-0 at home, while Purdue dropped to 0-4 in true road games this season. The Boilermakers (9-6, 2-2 Big Ten) have already played six games against ranked opponents, going 2-4. Going into the game, Purdue knew it would have to get physical to stay with Michigan State (14-2, 5-0) and it made every effort to do so. Freshman big man Trevion Williams was a revelation, refusing to be intimidated by Michigan State's big bodies inside and putting up career-highs with 13 points and 12 rebounds for his first career double-double. The Chicago native has been solid in short stretches this season, but had never played more than 12 minutes in a game. Tonight, with Evan Boudreaux nursing a groin injury in the second half and Matt Haarms picking up his fourth foul with 12:54 left, Williams had to play 21 minutes. He handled the extra work with aplomb. "It was just a mental thing for me, just trying to keep myself in the game," Williams said. "Coach (Painter) will always preach to me, 'Do the things that will keep you in the game,' which is rebounding, defense. So, that was my main focus, trying to play as hard as I can because (Spartan forwards) Nick Ward and Xavier (Tillman), those are tough guys to play against. Just trying to knock them out of the post." Williams was particularly influential during a Purdue run in the second half. 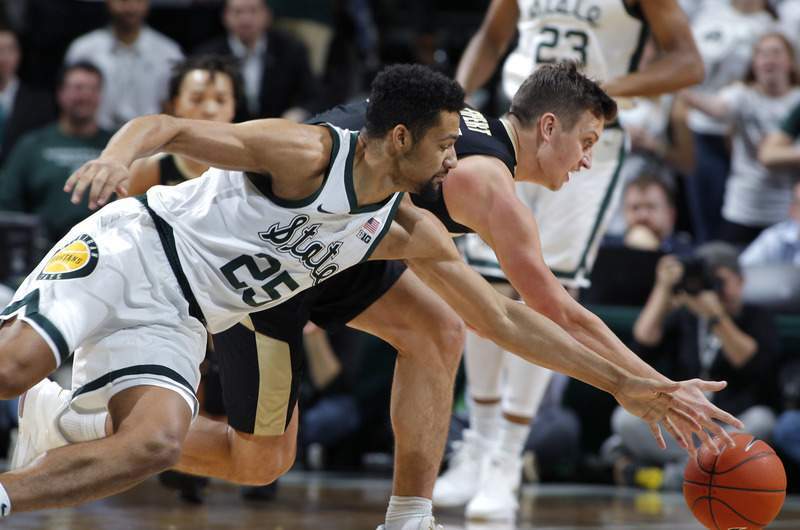 The 6-foot-9, 280-pounder grabbed five rebounds, scored a basket and blocked a shot all in the span of four minutes, as Purdue cut into what had been a 14-point Spartan lead early in the half. When Carsen Edwards buried a 3-pointer from the top of the key, Purdue was within 52-48 after a 12-2 spurt. Michigan State recovered, however, and extended its lead back to double digits as the game entered its final minutes. As the physicality continued, fouls piled up for both teams and the Spartans made more of their free throws. Michigan State hit 84 percent from the line, to Purdue's 55 percent. Purdue never got closer than four points and began to fall further behind following Edwards' 3-pointer. "A little bit of everything (went wrong)," Painter said of the stretch following Edwards' shot. "Cassius Winston had a lot to do with that. ... It was hard for us to get any continuity on either end tonight. We'd do some good things, but we just weren't consistent in getting stops or getting rebounds or making shots." One of the final turning points came with 4:54 left, when Winston buried a 3 at the end of the shot clock following an excellent defensive possession for the Boilers. It put the Spartans up 13 and deflated a Purdue team that had given everything it had. The deep jumper sparked a 9-0 Spartans run that put the game on ice. For Winston, the shot completed his fourth 20-point effort in the last five games. He did not score at all in the game's first 16 minutes, but exploded thereafter, hitting four 3-pointers, grabbing six rebounds and dishing five assists. Purdue raced out to a 9-2 lead in the opening minutes, punctuated by a deep 3-pointer from Ryan Cline on the right wing that momentarily silenced the crowd. Cline was Purdue's best offensive weapon all night, burying four 3-pointers, the fifth time this season he's reached that mark, but the rest of the Boilermakers were off the mark from the outside, hitting just 3 of 21. Fort Wayne native and former Bishop Dwenger forward Grady Eifert had six points, six rebounds, two assists and two steals for the Boilermakers. Edwards had one of his worst games of the season. The junior guard came in fourth in the nation in scoring at 25.5 points per game, but managed just 11 points on 3 of 16 from the field and 2 of 13 from beyond the arc. It was the first time all season he had scored fewer than 19 points in a game. "It comes with basketball, sometimes you have off nights," Edwards said. "They're a good defensive team. ... Shots didn't fall. I got looks that I normally get. Shots didn't fall, some went in and out. It's alright." Purdue has not beaten a top 10 team on the road since February 2010, when it toppled Ohio State.